Modern day smartphones work nice and fine, but if they ever had one Achilles’ Heel to pick from, then my favorite choice would be the battery life – or rather, the lack of it.How many of you have a fully charged up smartphone in the day, only to find out that the power levels have dropped to near zero by the time you get home at night, and this also when you use it normally like your featurephones, with push email being turned off as well? It makes sense then, to carry around additional peripherals to juice your phone on the go, such as a cigarette lighter charger for your car, as well as keeping a spare charger at the office. Well, another thing about modern day smartphones – most of them have seen heavy investments made to their aesthetics and design, and if you are looking for a surefire method to turn a smartphone ugly, slap on a PowerSkin case, and the job is done for you. The HTC One S is the recipient of such a case today, despite the fact that it is not the flagship model from HTC at the moment. The HTC One S PowerSkin is said to come with 1500 mAh of battery-boosting power wherever you are, in addition to other specifications such as an on/off button that enables users to choose when to activate a charge, LED lights indicating battery level remaining and charge status, not to mention the ability to synchronize the smartphone straight to computers thanks to the included cable. Do you have $69.99 to spare? 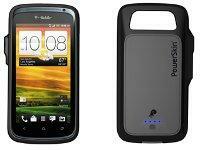 If so, then the HTC One S PowerSkin might just be the protective case for your HTC One S that you have been looking for.